Last Friday night I attended a very special screening of "Casablanca with the San Francisco Symphony" at Davies Hall. Conductor Michael Francis led the orchestral accompaniment and a full house spent the evening in thrall to Warner Bros.' sublime 1942 film classic and composer Max Steiner's unforgettable score. The San Francisco orchestra interpreted Steiner's music a bit more gently, with less bombast, than the original movie soundtrack. The experience of a live score lent both immediacy and charm to the viewing experience and it was interesting, from time to time, to steal a look at the musicians as they accompanied familiar scenes. The harpist was fascinating to watch and listen to during the Paris flashback sequence. The essence of magic that is new love seemed to float from her strings. I've loved and admired Casablanca for years but it wasn't until I sat watching from high in Davies Hall that a particular thought occurred and recurred in my mind..."this film is perfect." 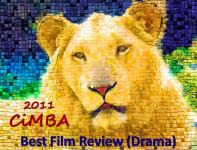 In every respect...direction, cinematography, set design, screenplay, dialogue, wardrobe, score, editing - and the cast. This is Bogart at his apex as a romantic lead, Bergman at her most beautiful and pure - along with a most eloquent supporting cast: Claude Rains, Paul Henreid, Conrad Veidt, Peter Lorre, Sydney Greenstreet, S.K. Sakall, Madeleine Lebeau (the last cast member still living), Dooley Wilson, Joy Page and Leonid Kinskey. It's no surprise that Casablanca was honored with eight Academy Award nominations and won for Best Picture, Best Director (Michael Curtiz) and Best Screenplay (brothers Julius and Philip Epstein and Howard Koch). Humphrey Bogart was nominated for Best Actor, Claude Rains for his supporting role, Max Steiner for his score, Arthur Edeson for cinematography and Owen Marks for editing. I found out that the timing of the film's release was auspicious. 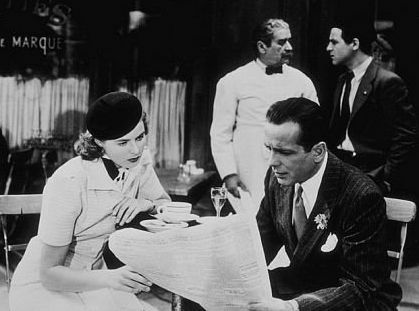 Casablanca premiered in New York in November 1942. The Allies had invaded North Africa earlier in the month - which was significant. Even more powerful was the fact that in January 1943 President Roosevelt and Prime Minister Churchill met in Casablanca to discuss the terms of an Axis surrender. This became headline news at the end of discussions, on January 24. Casablanca had gone into national release the day before...a windfall for Warner's PR team. According to Rothe, Steiner wove four major musical themes through the film. 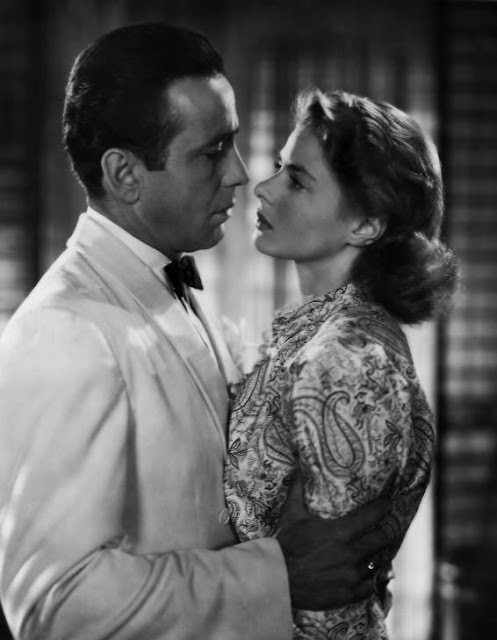 The first, of course, is "As Time Goes By," a song that became immortal with Casablanca. The second is the romantic theme accompanying the flashback to Paris. The third theme is France's national anthem, the "Marseillaise," first played as part of the title sequence, but most memorably featured when Victor Laszlo leads the crowd at Rick's in a stirring rendition of the anthem. A conscience-stirring variation on the "Marseillaise," first heard when Ilsa tells Rick about her devotion to Laszlo and the Resistance, is the fourth theme. The entire night was thrilling (and I hope the fact that it sold out will persuade the symphony to do this again), but there was one moment I don't ever want to forget...listening to the San Francisco symphony play "Perfidia" as Bogart and Bergman dance (and he presses his face to hers) ...exquisite! Meanwhile, Max Steiner's day is not done in San Francisco. Friday, July 29, the Castro Theatre begins a seven-day, 13-picture program, "Legendary Composer: Max Steiner." Included in the series will be Mildred Pierce, The Letter, Casablanca, Treasure of the Sierra Madre, Gone with the Wind, Now, Voyager, Dark Victory, White Heat, Angels with Dirty Faces, The Big Sleep, Key Largo, King Kong and The Searchers. Click here to learn more. You write such beautiful pieces. Isn't it amazing how seeing a film on the large screen (the way it was meant to be seen) can change the way we feel about it? After seeing "Lawrence of Arabia" on TV for years, I finally saw it in all its big screen glory. A great film suddenly became a GREAT film in my eyes. How magnificent. I wish I could have been there. What an experience for any lover of this film. It's one of my favorites, and to see it with an orchestra -- sublime. Thanks so much for this description. Your mention of "Perfidia" is interesting. I don't think too many people know that "As Time Goes By" was not introduced in this film; it is an older song from the early 1930s. "Perfidia" was the song introduced in this movie, and unfortunately we don't get to hear too much of it. I have seen a few silent films with a live orchestra but never a sound film (I assume they stripped the soundtrack of all its music)! It sounds like you have a magical night. CASABLANCA is just one of the sublime mysterious of cinematic life where all the stars were aligned perfectly. Pure magic from beginning to end. The film actually played here, minus the live orchestra, a few weeks ago as part of the Tampa Theater's Summer Classic Film Festival. Unfortunately, I could not attend but I would love to see it on the big screen. FlickChick - Thank you! And I completely agree about the impact of seeing films in a theater setting. Movies were intended for big theater screens and are best appreciated on them - plus there's the enjoyment of being part of an audience. For example, at "Casablanca with the Symphony" the audience cheered the entrances of Bogart, Bergman and Rains - as well as the demise of Conrad Veidt (who, I understand, was virulently anti-Nazi in real life). Jacqueline - I wish you had been there - "Casablanca" has also played with the Atlanta and Seattle symphonies this year and I hope it makes its way to all U.S. symphonies. I learned, in Larry Rothe's program piece, that "As Time Goes By" debuted in a Broadway musical in 1931 but made little impact - until "Casablanca." I'll admit to being mad for "Perfidia" (aka/perfidy) not only in "Casablanca," but also "Now, Voyager" and all three of my favorite Wong Kar-wai films ("Days of Being Wild," "In the Mood for Love" and "2046"). John - Only Dooley Wilson's songs weren't stripped, though the string section did subtly accompany his performances. I did have a magical night - I hadn't known what to expect but the evening exceeded my expectations. As mentioned, I've always considered "Casablanca" a great classic, but the symphony performance really brought its elegant and total perfection home for me. Lovely piece, Eve. It must have been a glorious experience. And that line-up to come! Why does something as banal as money have to come between a movie lover and such opportunities! You shared the experience beautifully. What a thrill! "Casablanca" and Steiner both define timeless. It's coming to Chicago in the fall, with the Chicago Symphony Orchestra. I was debating about whether to go, but your piece may have turned the tide for me. I may go. I do hope one day they can do the same thing with Korngold's "The Adventures of Robin Hood." With the famous CSO brass section, it would make a terrific evening. That's also a terrific lineup of films at the Castro. Becky - I'm hoping to see at least one of the Steiner films in the Castro program - what a selection! "The Letter" and "Now, Voyager" are beckoning. Caftan Woman - Truly timeless...nearly 70 years later and "Casablanca" is as powerful as ever. I don't know if the film will make its way to Canadian symphony halls, but I hope so. Kevin - If I'd known you were hesitating about buying tickets to "Casablanca" with the Chicago symphony I'd have written a longer more glowing post with you in mind. Please go! Lady Eve, you have written an evocative and poignant piece on the pleasure of watching classic films on a large screen. I appreciate your sharing the experience, as one who doesn’t have access to such venues (even if I’m a wee bit jealous). The salute to Max Steiner, both with the San Francisco Symphony and at the Castro, is inspired. Ingrid Bergman does fairly shine as Ilsa; the flash of light caught in her earrings outshined only by the gleam in her eyes as she sees Sam again for the first time. The brief clip with Sam and Ilsa dancing to Perfidia, as you observed, captures the bittersweet days of their love and the events that follow in the days ahead. May I compliment you on the new look of your blog; is the image a photo of your beloved Castro Theater? This sounds like a beautiful evening, and it warms my heart that it was sold out! Great to see that such events are still popular, and hope this bodes well for the future of the classic. Meredith - It was a beautiful evening and I was happy to hear the event had sold out - it was exhilarating to look around the hall and see all those seats filled. The audience reaction, too, was heartening: the crowd was involved and appreciative. Eve, How wonderful. I wish I could have also been there. What an amazing experience to watch such a wonderful classic movie with a orchestra. Thank you for sharing your wonderful evening with us. I thought EDO DE WAART was still conductor...some of the studio orcheastras back in the day were top notch...i.e. THE NBC RADIO SYMPHONY!! Hi doc - Glad you enjoyed the post. The current music director of the San Francisco Symphony is Michael Tilson Thomas - who conducts major concerts. There are others who conduct different programs. I'm going to have to look at the credits on "Casablanca" to find out what orchestra is responsible for the original soundtrack. I would love the chance to see Casablanca on the big screen, especially with the live music. Hopefully it comes my way soon. Meredith - Kevin Deany commented (above) that the Chicago Symphony is scheduled to accompany "Casablanca" one night this fall. 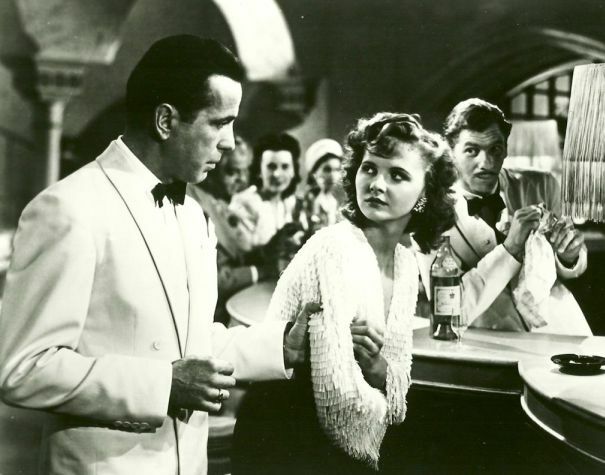 The Richmond (Virginia) Symphony will accompany "Casablanca" on Sat., Oct. 1. Anyone who lives near a city with an active symphony should go to their symphony's website and check the events schedule page.This is an experience no lover of classic films would want to miss. Great piece! The Chicago Symphony has a series called "Friday Night at the Movies," and I've attended a number of the concerts over the last few years. At first, it was silent films accompanied live by the symphony ("Phantom of the Opera," "The General," "Modern Times"). A few years ago, they did a salute to Rogers and Hammerstein on film by selecting a variety of film clips, stripping out the score and playing live to the remaining vocals -- what a kick to hear Shirley Jones and Gordon MacRae sing to the live orchestra! Then they offered "The Wizard of Oz," and next year I believe it's several films, "West Side Story" on Nov. 25 and "Casablanca" on Jan. 6. Any chance to hear a movie score performed by a world-class orchestra is worth it. Thank you, Filmboy, and thanks for more about the Chicago Symphony series. I hope you're able to see "Casablanca" when it screens. The idea of stripping out the score of a classic film and screening it with live accompaniment by a symphony orchestra is a great way to promote classic films and symphonies. As mentioned, it was wonderful to learn that the night sold out (I should have guessed as much since most of the best mid-range seats were gone by the time we bought our tickets).